A city is constructed in layers: infrastructure, streets, population, buildings. The same is true of the city in time: in shifts in decay and gentrification; in layers of differing architecture in form and layout resonating certain eras and modes in design, material, use of space and theory; in urban planning; in the physical juxtaposition of points and pointers from different times. Context and sub-text can be formulated as much in what is present and in juxtaposition as in what one learns was there and remains in faint traces ( old signs barely visible on brick facades from businesses and neighborhood land usage long gone or worn splintering wooden posts jutting up from a railroad infrastructure decades dormant for example) or in what is no longer physically present at all and only is visible in recollection of the past. The project “34 North 118 West” utilizes technology and the physical navigation of a city simultaneously to forge a new construct. The narrative is embedded in the city itself as well as the city is read. The story world becomes one of juxtaposition, of overlap, of layers appearing and falling away. Place becomes a multi-tiered and malleable concept beyond that of setting and detail to establish a fictive place, a narrative world. The effect is a text and sound based virtual reality, a non passive movement, a being in two places at once with eyes open. 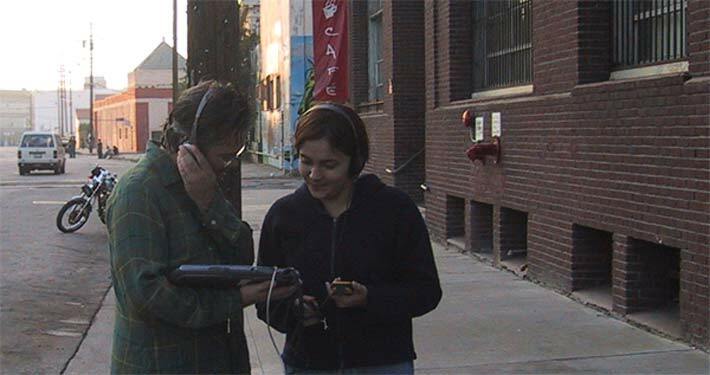 The participants walk the streets of a city with a G.P.S unit attached to a lap top computer. 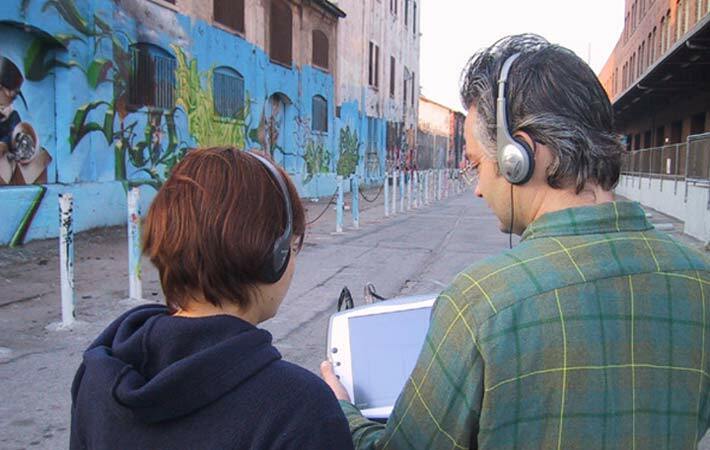 Headphones for up to 5 at once are attached to the computer and worn by the participants. On the laptop is a map with a marker that identifies the participants’ location. The marker moves along the map tracking location and movement through the city grid. Data triggers are set along points in the physical city by latitude and longitude. Some triggers or “hot spots” are marked as squares on the map while others are left to be discovered. All written narratives are read by voice actors to create an overlap experience in real time of experiencing two places at once. The only visual is the map that tracks one’s movement and shows hot spots and the distance readings on the g.p.s unit. This narrative appears in 34 north 118 west at the end of a vast empty lot. Train tracks appear at the end of the lot along with a section of asphalt split to reveal turn of the century cobblestone street. The tracks suddenly stop and it is at this stark end that the story is triggered by satellite. The physical placement is highly metaphorical on several levels. The vast empty lot resonates with a sort of melancholy in its dust and debris akin to the man’s mind and his dark forgetting and shards nof memory. It also is where the rails suddenly stop that is physically jarring and stark in itself in the physical city and this is akin to the narrative in the dead men at their end of life and the narrator looking back at ill formed phantoms in his memory. It is also where a homeless tent city once stood in the 1980’s that was well documented at the time in the press and of which there is no physical trace as well as where a building identical to the mile and a half long former turn of the century freight depot now used as Sci-Arc (an architecture college) once stood and again there is no trace, as though it is spatially forgotten and thus failed. All of the intellectual endeavours utilized to analyse the data of the city from architecture to ethnography and history are part of the narrative. The author in this new model can work with all the data of the city itself as well as narratives written to symbiotically function within the city details past and present made open to experience and interpretation by the reader walking the city. A fantastic thing has occurred. The creative and critical voices are fused as the participant walks the city. The key is the usage of sound. Walking the city with sounds from different points in time and metaphorical relationships with what is being seen allows the author to guide a fused experience of critical analysis and creative writing. By researching the city itself before writing and selected key places to trigger narratives, the author establishes an experience where the participant is navigating both fictive/story world and present world (which flies in the face of the basic concepts of virtual reality and reading of novels historically…….of passively sitting in one world and imaging active movement in the other….now there is movement in both and it is simultaneous) but a sort of light shined of analysis lit on specific points in the city in their layers and reading. This narrative is strongly tied to its physical placement and is a weighted narrative. 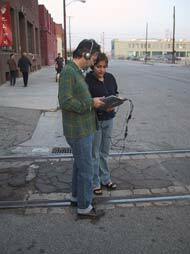 The narrator is based on a composite of the many Latina women who worked in railroad and related industry in the 1940’s. The narrator would have only known weather reports as based on ship reports as that was the g.p.s equivalent of the day in the sense of data transmission from certain points in space to formulate larger data patterns. It also in retrospect left much room for error and is one of the reasons that concepts like “surprise storm” in research were found to be quite pervasive in newspaper headlines in earlier eras. Weather forecasts from newspapers at the turn of the century made forecasts for up to a week in advance, which is even now statistically low percentage forecasting with satellite and radar. She also is referencing absence as presence when she describes the food “ the neat little cheddar square….gone ….but there it is” This is one of the larger issues addressed, of how what is gone remains, and how what is unsaid or not initially visible can carry great weight. The building described in the story may be gone and in its place something completely in opposition. …..the La Grande station was also home to both Japanese Americans shipped to interment camps and just after it was closed before being demolished, Judy Garland smiling in the same doorway singing the song of the Santa Fe railroad ( “Atchison…Topeka ….and the Santa Fe” ) in a Hollywood musical….a beautiful glass domed building once the main passenger station in Los Angeles before Union Station and now in its place is electrified fence, garbage and a storage facility. The participant/ reader experiences the literal and semiotically charged cities simultaneously. The awareness of metaphor and sub-text builds along with a casual walking through the city. This occurs without the authoritative tone of critical language as it is to be inferred experientially as the author has written the analysis into being by the very places selected to trigger sounds and narratives as well as their content and its layers of resonance and reference. The present city and past incarnations are experienced at once. The author now is to function like an ethnographer and archaeologist. The pop culture notion of archaeologist is one of the scientist digging in desert Africa or Egypt. In this general sense, the archaeologist is digging vertically into the ground. Presumably, in a good dig site, layers will emerge as one digs deeper. Artefacts will shift as one digs deeper into what was once topsoil. Time and its artefacts are thus presented vertically to navigate and uncover. The author, however in the new writing of narrative archaeology is working within the city, its streets, layers of cultural resonance and population, and, of course, buildings….many of which may remain unchanged over time. Thus, the navigation , as in the walk in a city, is a vertical one. In this vertical movement artefacts are also available and layers in time exist. They are held in data and in the past. In 34n118w stories, population distributions and points of resonance in the physical city may be from 1937 then a hundred feet ahead 1903 then 1960………all creatively and intellectually formed from elements in research and from the past. The author by composing and placing narratives and sound is establishing artefacts culled from layers in time. The creative texts composed for insertion into the city are constructed in a way that allows for the charms of the “traditional” text as well as of the “experimental” The narrative is constructed in individual unit as a short short or prose poem. The piece can stand alone as a work of creative writing with rich language, imagery, detail, and a sense of narrative arc fulfilment in resonant ending. It also is constructed to be read such that at certain key points in the city, to be read on multiple levels. The narrative may have detail but only enough to create a half sense of place thus enhancing the awareness of two places at once in the physical city. The narrative may be written in style as well as detail and content to enhance the discontinuity of place being experienced by the viewer/reader, of the disjunction between what is imagined and referenced and what physically, at present, is. The author also has a physical distribution of stories along city streets and landmarks to work with in writing and placing texts and sound. Much of 34n118w was composed in final revisions by working with a physical map and notes from multiple walks through the space. This aids in the building of meta-text. Certain texts distributed through the grid at key places as well as intervals in navigation are built to be “weighted” or “enhanced” text. A basic construct of semiotics is of the dual readings of meaning, an obvious example being “soda” …..the can handed to you is accepted as soda at face value at a county fair, but isn’t “can” what has the name printed on it and the opening you are using to drink from? Soda is the shapeless fluid held inside the can. Also, the same occurs in association with a word marker such as “Car” ( …dictionary definition: …..internal combustion engine…..rubber tires……..bla bla bla……..) but you may have been born in a taxi, you may have just gone to the circus and saw 15 men pile out of a tiny mini cooper, you may have seen a horrible wreck years past that you can’t shake from your memory, you may drive only station wagons……..thus, again a word is a container…………..car is the container and the associations inform it from within like an unseen fluid. The selected texts as weighted are constructed by the author to specifically reference metaphorically the larger issues and concepts to be addressed. These short short narrative vignettes are to be constructed with the sort of image play that informs allegory to a degree. In 34n118w’s meta-text are analysis of issues and concepts such as the resonance of data as rich with meaning, the lineage in technology of communication and transference of information from g.p.s ( back through ship reports, railroad infrastructure, Morse code…), and the many metaphorical readings of absence as presence and “ghost”. The meta text is informed by the details and metaphors in individual narratives that are written to reference these ideas, again without the intrusion of the critical voice and dry authority. Instead, what is allowed to build is a cumulative resonance. The author can slowly build through repetition and subtle similarities in detail and of course physical placement and interaction of story space with points in the physical city. The author can place the larger concept references and resonances in sequences of his/her design both thematically and to build through repetition but also in the streets and city-scape. The author now has the freedom and range to build “traditional” and “experimental” tools and forms in a new way that makes the author able to structure for effect within individual texts, within a larger sequence of texts, within individual and multiple physical points, readings and placements in the city, within a meta textual construct built in both the narratives and city cumulatively, and even more importantly with a powerful component of play. One of the fascinating elements of writing and constructing a work such as 34 north 118 west is in its multiple physical and thematic interfaces. The work is not a linear start to finish along prescribed path in city and story blocks. The participant has multiple cohesive experiences and thus work depending entirely on their chosen path. A 15 minute jaunt up one street, through an alley and down the next street will be fulfilling and follow all the elements of construction, possibility and meaning previously described. Another jaunt up and around a completely different set of streets will have the same effective richness in perhaps a half hour, and a walk of all the streets, narratives and sounds in its totality will be equally fulfilling as an experience and as an exploration of narratives of the many layers of the city. And they will all be different. The work is now not only removed from the page, from the separation of critical and creative voice, from the gallery and its long mined semiotics of exclusion and disconnect by nature of presentation as well as of published book or magazine as fetish object connected to the finality of form and translation into being as “finished”, but also removed from a non-multiplicity. The author now in narrative archeology is to construct a work that has many different permutations by design, and the participant experiencing it in their choices of navigation whether based on time, interest in physical streets and buildings in particular or just by intuition will be in a sense an ultimate generative author. Utilizing global positioning satellites allows the viewer to trigger and thus build the experience and resonance by their physical presence and movement. Jeremy Hight is a locative media/new media artist and a writer. 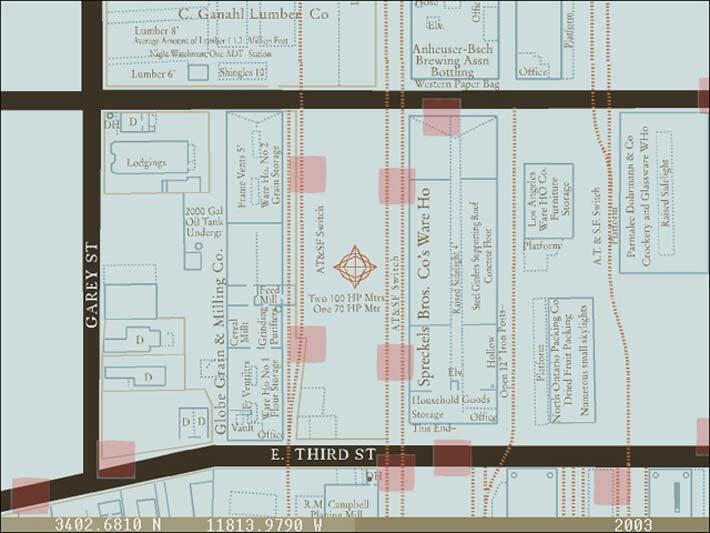 He is credited with inventing locative spatial narrative in the first locative narrative project 34 north 118 west. 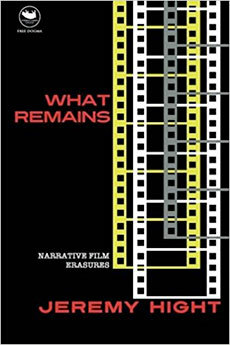 This essay – first published in streetnotes – was named one of the 4 primary texts in locative media. A retrospective look at his work and a look at "reading" the landscape is in volume 14 issue 08 of Leonardo. He has published over 20 theoretical essays and exhibited work in festivals and museums internationally.